Welcome to the blog that concerns all dinosaurs that are more closely related to (and including) Tyrannosaurus rex than to the English sparrow (Passer domesticus). This will be the place to read about tyrannosauroid osteology, ontogeny, and phylogeny, as well as updates on my tyrannosauroid research as it happens, my thoughts about new scientific discoveries on tyrannosauroids, and the occurrences of tyrannosauroids in pop culture. I was recently interviewed by Arsen Kazaryan on things tyrannosauroidean for his youtube channel. Depending on the feedback on these, I will do a follow-up Q&A post. In our recent publication (Carr et al., 2017), we presented a cladistic growth series for Daspletosaurus horneri in Figure 3. The complete list of growth changes that we recovered are listed, in code form, in the supplementary materials. In the interests of saving you the trouble of scrolling up and down multiple pages at a time, I have put together an illustrated summary of the growth stages here. For convenience, the codes are listed in each heading. The following convention is followed for the labels in all of the images: a solid leader line extends to a feature that can be seen in lateral view, whereas a dashed line points toward a feature that is out of the plane of view. At this stage, all of the images that I can offer are in lateral view. Therefore, some features are simply not labeled, but they are listed following the illustration. Be forewarned that some features, although they are labeled, may not be clearly seen or not seen at all; i.e., some labels indicate simply where to look and I apologize in advance for that limitation. This growth stage is represented by the juvenile paratype dentary. No mature features were recovered for this growth stage since all of its characters were scored as "0". Regardless, this specimen reveals many juvenile features for the dentary, including small body size, as inferred from the length of the tooth row. This growth stage is represented by a juvenile maxilla. One unambiguously optimized feature was recovered for this growth stage, large size, as given by the length of the tooth row. This maxilla has many features that are representative of the juvenile condition, and they are labeled in the figure below. GROWTH STAGE 3 (exemplar: MOR 590): 2 (1), 6 (1), 8 (1), 11 (1), 14 (1), 19 (1), 20 (1), 21 (1), 22 (1), 28 (1), 30 (1), 33 (1), 34 (1), 37 (1), 38 (1), 40 (1), 42 (1), 43 (1), 45 (1), 49 (1), 50 (1), 52 (1), 53 (1), 164 (1). This growth stage is represented by the imposing skull and jaws of the type specimen, MOR 590. Given the limitations of the data set, all 24 of the unambiguously optimized features pertain to the maxilla. 40. Base of the medial interfenestral strut is positioned at or behind the midlength of the lateral strut. 42. Caudal antromaxillary fenestra is close to the anteroventral margin of the internal antorbital fenestra. 43. Epiantral recess is deeply excavated. 45. Palatal process of the maxilla is sigmoid in shape. 49. Margin of the choana on the maxilla is positioned caudally, where it extends along the level of alveoli 7-10. 50. Distinct depressions for dentary teeth below the rostral end of the palatal process. 52. Interdental plates are positioned close to the alveolar margin of the bone. GROWTH STAGE 4 (exemplar: MOR 3068): 135 (1), 136 (1), 141 (1), 144 (1), 145 (1), 147 (1), 148 (1), 153 (1), 155 (1), 156 (1), 158 (1), 161 (1). This growth stage is represented by a referred partial mandibular ramus, and all 12 of the unambiguously optimized characters pertain to the lower jaw. 156. Dorsoventrally shallow medial bar. 161. Massive and rostrally extending medial ridge on the caudal process of the splenial. GROWTH STAGE 5 (exemplar: MOR 1130): 134 (1), 137 (1), 138 (1), 142 (1), 143 (1), 146 (1), 150 (1), 151 (1), 152 (1), 157 (1), 159 (1), 162 (1), 163 (1). This growth stage is represented by the majestic paratype adult; all 13 unambiguously optimized characters pertain to the mandibular ramus. The limited data set results in only a batch of characters unambiguously optimized for the caudal- and mid-regions of the mandibular ramus. 162. Bar below the rostral mylohyoid foramen of the splenial is dorsoventrally deep. 163. Fossa along the dorsal margin of the rostral mylohyoid foramen is absent, where the corresponding surface is convex. Although we successfully obtained a growth series for D. horneri, the incomplete nature of the majority of the specimens results in a limited account of the changes across the entire skull from stage to stage. Instead, we obtained a patchy picture of the sequential changes that happened during growth, which will hopefully be filled by future discoveries of complete juveniles. Also, at this point we did not provide any explanation for the changes that occur; that will be the subject of a future work (by me) that will make comparisons across derived tyrannosauroids (Bistahieversor + Tyrannosauridae). Carr, T. D., D. J. Varricchio, J. C. Sedlmayr, E. M. Roberts, and J. R. Moore. 2017. 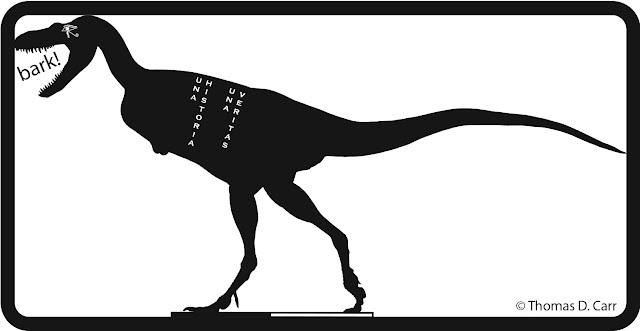 A new tyrannosaur with evidence for anagenesis and crocodile-like facial sensory system. Scientific Reports. Doi: 10.1038/srep44942. In our article (Carr et al., 2017), we argued that Daspletosaurus horneri was the end point of an anagenetic lineage of tyrannosaurines. Anagenesis is the mode (process) of speciation (production of a descendant species from an ancestral species) where an ancestral species, under the action Natural Selection, is modified into a different descendant species. Anagenesis is different from cladogenesis, where an ancestral species is split by a geographic barrier, or by the emigration of parts of the ancestral species into other areas, into two or more subsets that are subsequently modified by Natural Selection into different daughter species. Empirically, cladogenesis is thought to occur more frequently than anagenesis. Cladogenesis is implied by the structure of cladograms that show hypothetical ancestors dichotomously splitting into descendant lineages. Although cladistic analyses may accurately show sister group relationships (recent common ancestry), the branching pattern may not map onto the actual speciation mode. Therefore, it is reasonable to assess whether or not anagenesis is a defensible hypothesis as the explanatory speciation mode. In our view, there are four criteria that must be satisfied in order to propose a hypothesis of anagenesis. What follows is an explication for each. 1. Sister group and successive sister group relationships. If two species are considered for anagenesis, then they must be sister species; if more than two species are considered, then they must form a successive series of sister groups. In the case of Daspletosaurus, D. torosus and D. horneri are sister species. Horner et al. (1992) proposed that Tyrannosaurus rex was the culmination of the D. torosus -> D. horneri -> T. rex anagenetic series. However, in our phylogeny we recovered T. rex as the sister species of T. bataar, which are situated in a separate branch of the tyrannosaurine family tree. Therefore, T. rex cannot be considered as part of the Daspletosaurus lineage, since it actually belongs to another clade; as such, T. rex is excluded from this hypothesis of anagenesis. 2. The candidate species must occur on the same land area or on adjacent land areas. If a candidate ancestral species is found, say, on the opposite side of the world or on a different hemisphere, relative to the descendant species, then this would weaken a hypothesis of anagenesis, especially if the species are successive in time. The reason for this is that distance is evidence for the time taken for descendants to leave the ancestral area: a greater distance implies a greater time taken. Both species of Daspletosaurus are from the northern Rocky Mountain Region, from what is now Alberta (D. torosus) and Montana (D. horneri), and so they satisfy the requirement for occurrence in the same land area (at the regional level). 3. The candidate species must be successive in time. D. torosus lived earlier than D. horneri (see the diagram above), which does not conflict with the sister group relationship between the species. Alternatively, it is absurd to suggest that the geologically younger D. horneri is the ancestor of the older D. torosus. 4. The sister group relationships of the candidate species must not conflict with their chronological sequence. With the hypothesis of Horner et al. (1992) in mind, although D. horneri does precede T. rex, the suggestion that D. horneri is the ancestor and T. rex is the descendant, violates their actual evolutionary relationship, where they are separated from each other by several ancestors; i.e., they are on separate branches of the tyrannosaurine family tree. The sister group relationship between D. torosus and D. horneri does not conflict with the chronological sequence of the species. Taken together, the sister group relationship, geographic location, chronological sequence, and lack of conflict between sister group relationship and chronological sequence provides evidence that anagenesis is a viable hypothesis to consider in the case of D. torosus and D. horneri. There are cases where all of these criteria may be satisfied, but the hypothesis of anagenesis may be weak, and so we may introduce the idea of levels of inference. The first level of inference applies to cases that satisfy all of the criteria, if and only if the distance in space (criterion #2) is absent or minimal, and time (criterion #3) is brief. Daspletosaurus is an example of a level 1 inference because the land areas are adjacent (on a sublandmass scale) and the time separating them is a narrow 100,000 years, and the entire span of the lineage is relatively short, 2.3 million years. The second level of inference applies to cases that satisfy all of the criteria, except there is a great separation in time between the candidate species, or there is a great geographic separation between species, such as distant landmasses. We proposed another anagenetic lineage that is a second level inference, namely, the Zhuchengtyrannus magnus -> T. bataar -> T. rex series. At issue here is the total time span, where 73.5 Mya (Z. magnus) – 66.0 Mya (T. rex) = 7.5 Myr, which is represented by only three species, and gives each an extraordinary lifespan of 2.5 Myr. In this scenario, it is predictable that additional close relatives will be found in that long stretch of time, from which only three narrow slices are known. Intuitively there is no guarantee that any new species, once discovered, will not have sister group relationships with the others that conflict with anagenesis. The third level of inference applies to cases that satisfy all criteria, except the criteria of time and space are pushed to extremes, but stop short of being unreasonable. Carr, T. D., Varricchio, D. J., Sedlmayr, J. C., Roberts, E. M. and J. R. Moore. 2017. A new tyrannosaur with evidence for anagenesis and crocodile-like facial sensory system. Scientific Reports. Doi: 10.1038/srep44942. Horner, J. R., Varricchio, D. J., and M. B. Goodwin. 1992. Marine transgressions and the evolution of Cretaceous dinosaurs. Nature 358, 59-61(1992).